By far, one of the coolest things that happened to me this year is reuniting with a high school friend, Jenn, I hadn't seen for about 16 years. What makes this event incredible is that we went to high school in Canada, yet somehow, after each having called two other U.S. states "home," both of us ended up living within 5 minutes of one another in the Pittsburgh area! Another cool thing that happened, relatedly, is that one of our high school teachers happened to be passing through town, and so the three of us met up for dinner. Mr. B. was staying at a hotel in Cranberry, and having had a good meal at Restaurant Echo before, I suggested that we dine there. I arrived right at 6:00 pm sharp; Jenn and Mr. B. were already seated in the dining room. We hugged hello, caught up for a bit, and perused the menu. Mr. B. and I decided to split the Autumn Squash appetizer ("roasted squashes with dates, chicken pâté, housemade clarified apple butter, apple cider crème fraîche"). As the person who recommended the restaurant, I can't help but feel responsible for the quality of the food, so this is often the point in the evening when I start to feel some pressure. Luckily, Mr. B. seemed to enjoy the appetizer, as did I. 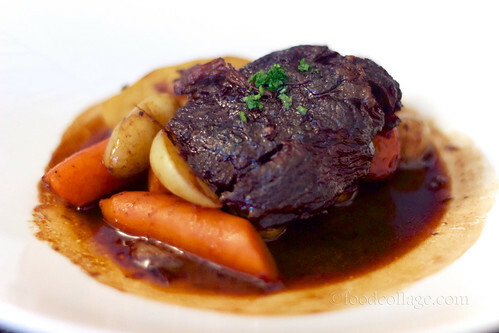 For my entrée, I simply couldn't resist the Beef Bourguignon ("beef short ribs braised in red wine and veal stock, fingerling potatoes, pearl onions, carrots"). R. and I had this dish in Paris while on our honeymoon last year and I have been thinking about it since. Restaurant Echo's version did not disappoint; the meat was melt-in-your-mouth tender and the sauce was flavorful. 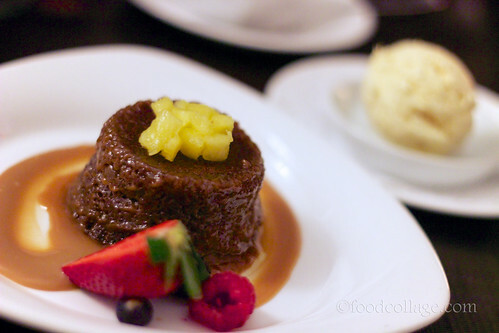 Finally, I could not resist the Ginger Molasses Toffee Cake dessert either, served with roasted pineapple ice cream, since I love ginger and I love toffee even more. We all thoroughly enjoyed our meal. The food was fabulous (phew! ); the only thing better was the company. For hours, we talked. We laughed. Mr. B. showed us pictures of his travels and recounted stories of former students he's visited lately. We laughed some more. Mr. B. talked about coming back for a longer visit later in the summer. We stayed until there were no other patrons left at the restaurant, yet the staff never made us feel uncomfortable or dropped hints that it was time to leave. In fact, the service was impeccable. It was an all-round excellent evening! So what to do with all this chow? A friend suggested a particularly meat-heavy Paleo Chili recipe from Paleo Table, so I thought I'd give it a try. The recipe calls for ground beef, sirloin steak, and Italian sausage, but I substituted the ground beef with ground venison instead. 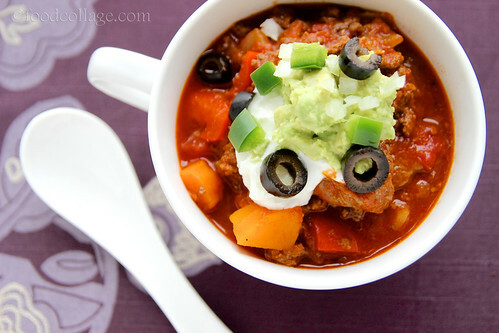 I can't quite claim that the chili I made is Paleo since I used regular, dairy-containing sour cream, so I thought the name "Three Meat Chili" would be more appropriate, because my version uses three kinds of meat: venison, beef, and pork. What's distinctive about this recipe is that it uses butternut squash as a replacement for beans (because beans are non-Paleo). I love butternut squash (and not so much beans), so I thought this was an excellent idea. R. likes butternut squash as well but missed having beans in his chili - a Paleo follower he is not. The olive-avocado-sour cream-onion-jalapeño garnish is a great addition as well. It is very different from anything I've even put on chili, but the creaminess gives provides a nice contrast against the spiced chili. I definitely think this is one recipe I will use again if I ever feel like something meaty! A couple months ago we went to Ohio to visit family. Our first stop was to spend an afternoon with Uncle Gary, who suggested preparing lunch together. Since we were due to arrive right around noon, however, I needed to come up with an idea for a super quick meal. My thoughts turned to mobile food vendors, since that is exactly what they do: preparing super quick meals. I immediately thought of Pgh Taco Truck, with its delicious and often unique flavors, and was inspired to create an easy but interesting and tasty taco. Something I can prep the night before and just throw in a skillet the next day. One of my favorite tacos from Pgh Taco Truck is an ostrich taco served with pumpkin butter, while R.'s favorite is wild boar...with pumpkin butter. So there was no question that pumpkin butter was going to be a must. From there, I chose chicken for the protein, which I would chop and marinate overnight and cook just before serving. I felt I needed one more main ingredient to go with the chicken, and since I was in the realm of fall flavors (don't judge - fall flavors are good any time of year! ), I thought apples cooked in cinnamon butter would work well. Place everything in taco tortillas and topped with some sliced green onions, and...voilà! I've got my perfectly easy but tasty taco! It was a big hit, if I may say so myself! Combine marinade ingredients in a bowl and mix well. Place marinade and chicken in plastic bag or a bowl and marinade in refrigerator overnight. In a skillet under medium high heat, heat butter and 1/4 tsp cinnamon until fragrant. Add apples, and cook for a few minutes until the cinnamon butter is absorbed. Remove from skillet. Season marinated chicken with salt and pepper and cook in skillet under medium high heat until cooked through. Double up tortillas and toast on a dry flat pan. Top with chicken, apples, pumpkin butter, and green onions. Slowly but surely, we've been chipping away at our seemingly endless supply of venison. Still, we had an abundance of ground venison and one can only make so many ground venison pizzas without getting bored! Then, a friend of mine who has been experimenting with venison cooking himself suggested marinating ground venison in bulgogi sauce and then making bibimbap with it. Now there's an idea! 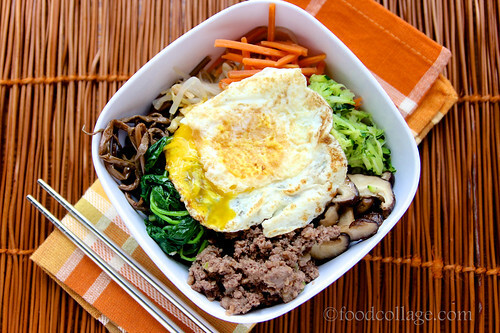 Bibimbap is a classic Korean dish that is basically white rice topped with vegetables, meat, and an egg cooked over easy, which you break and mix in with the rest of the ingredients before consuming. I've only had bibimbap in Korean restaurants and never even came close to attempting it myself. Luckily, I discovered Maangchi.com, a website with a massive collection of authentic Korean recipes that is run by a New York transplant who was originally from Korea. It didn't take too much digging before I found a bibimbap recipe. But first, I had to make a marinade. Although I had made bulgogi before using a different recipe, I decided to try Maangchi's just for variety's sake. I then marinated the ground venison in the bulgogi sauce overnight in the fridge. The next day, I made some rice in the rice cooker and prepared the veggies, which included shredded carrots, about 10-15 shiitake mushrooms, 4 small zucchinis, a package of fern brakes (also known as kosari and available at Korean supermarkets), bean sprouts, and spinach. Of course the combination of veggies is not set in stone, but I wanted to follow the recipe exactly in order to replicate the authentic flavor. I did double Maangchi's recipe as I had double the amount of meat. 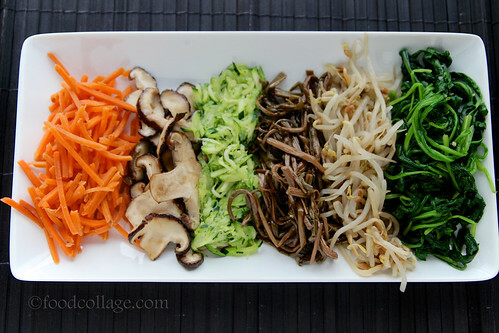 Because of all the different ingredients that required preparation, I found the bibimbap to be rather high maintenance and time consuming. It was worth the attempt though, as it was very tasty, and the ground venison which was slightly sweetened from the bulgogi marinade was astoundingly delicious. Though I may be too busy to make this on a regular basis, it was great to have discovered another way to use ground venison. 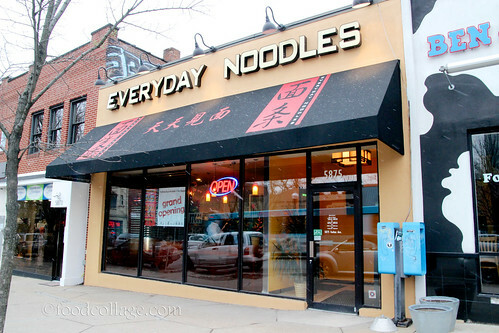 Everyday Noodles opened in Squirrel Hill in late February to much fanfare and excitement. The owner, Mike Chen, is none other than the father of Tamari's owner, Allen Chen, and has himself opened several Asian restaurants around town previously. 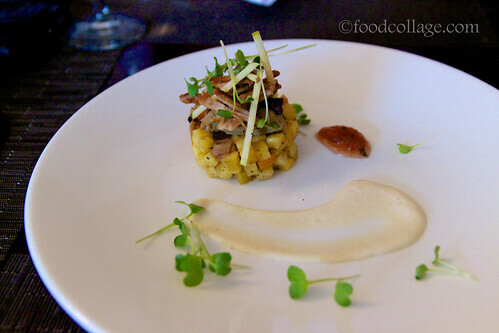 Between my two visits, I have had the opportunity to sample a few different dishes. I highly recommend the Pork and Crab Meat Soup Dumplings, which Everyday Noodles has become quite known for. 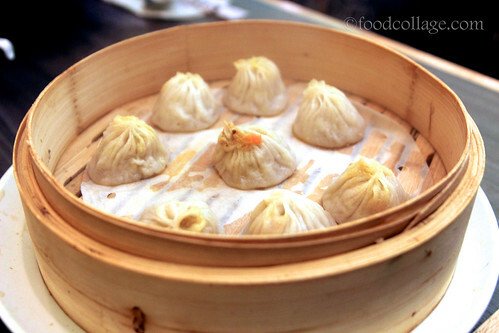 Chinese people are very picky about their soup dumplings - the wrapper, in particular, must be thin, but not too thin that it breaks easily on contact. 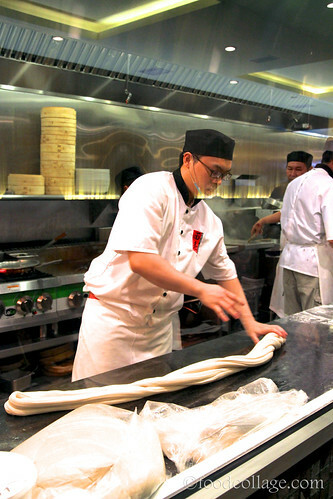 It takes a highly skilled chef to make soup dumplings just right. 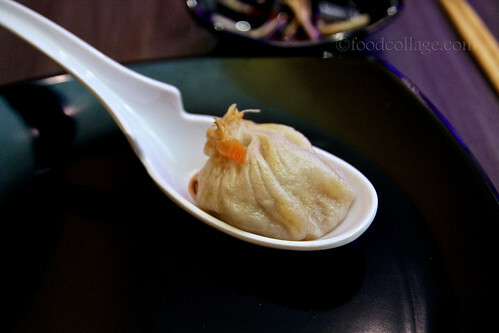 The ones at Everyday Noodles are excellent, with filling that is juicy and flavorful. 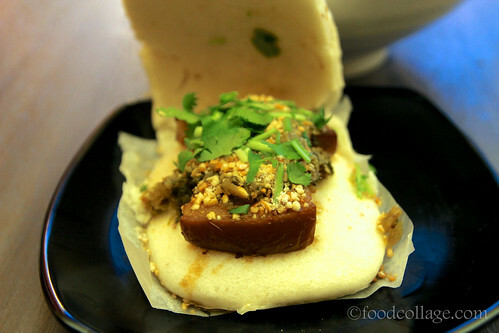 I also enjoyed the Taiwanese Style Pork Belly Slider, topped with chopped peanuts and cilantro, and served in a fluffy white and slightly sweet Chinese bun. It wasn't Momofuku-good, but it was solid nonetheless. 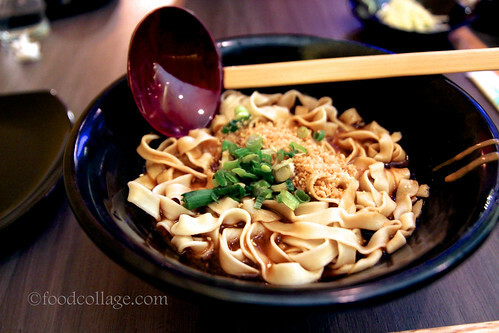 I've also had two different noodle dishes at Everyday Noodles, for which diners have a choice between thin or thick noodles. 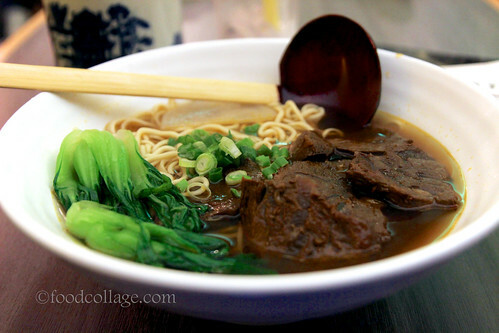 I tried the Braised Beef Noodle Soup with thin noodles, which was not bad, but I was really wowed by the Dan Dan Noodles Szechuan Style (with thick noodles) which was served in a delicious peanutty sauce and was not nearly as spicy as I would have imagined. Overall, I enjoyed the food at Everyday Noodles, and hope to try some desserts next time. I also have no complaints about the service; in fact, on both visits the owner himself was seen working alongside the waitstaff, greeting, serving, and chatting with the customers. By the way, the Chinese name for Everyday Noodles, 天天見麵, is a clever play on words: The first two characters (天天) in the name mean "everyday," while the third character (見) means "see." The last character (麵), though, is what's most interesting, as it means "noodles" but is homonymous with the word that means "face." In fact, if you look carefully at the design of the Chinese logo (see it on their website here) and focus on just the red part of the name, it actually reads 天天見面, with the last character being "face" (面) in red and the black part added to create the character for "noodles" (麵). The last two characters in red then, together, means "to see (a person)." Thus, when reading just the red part of the restaurant's name, it means "see you every day." Adding the black part gives it a dual meaning - literally to "see noodles every day." Indeed, Everyday Noodles, I'd love to see you - and your noodles - every day. We went to see a show downtown a few months ago and decided to make a date night out of it complete with dinner at one of my favorite restaurants, Braddock's American Brasserie at the Renaissance Pittsburgh Hotel. I have written extensively about Braddock's in my past posts here and here, so I will just focus on the delicious food here. I wanted to try something different this time, and the Whiskey Glazed Salmon caught my eye. The fish was cooked just right and was served on a bed of lyonnaise potatoes and asparagus. 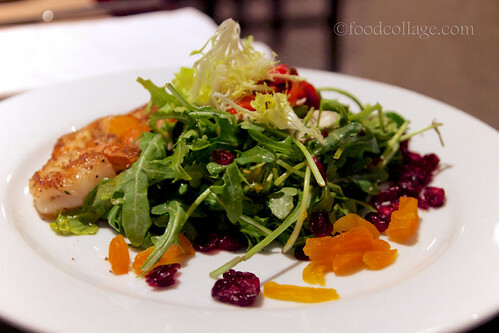 R. was not particularly hungry, so he just ordered an Arugula Salad, served with dried cranberries and apricot, and added Grilled Garlic Shrimp to it. 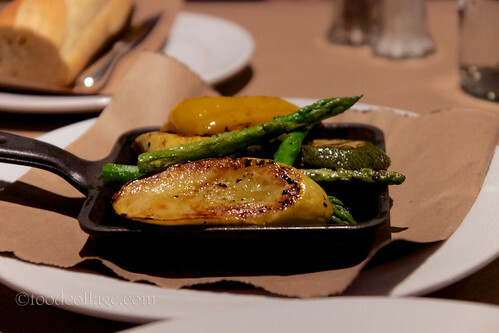 He also got a side of the Grilled Vegetables. As always, the food as well as service at Braddock's were excellent. I have now been to Braddock's four times and every time has been a positive experience!